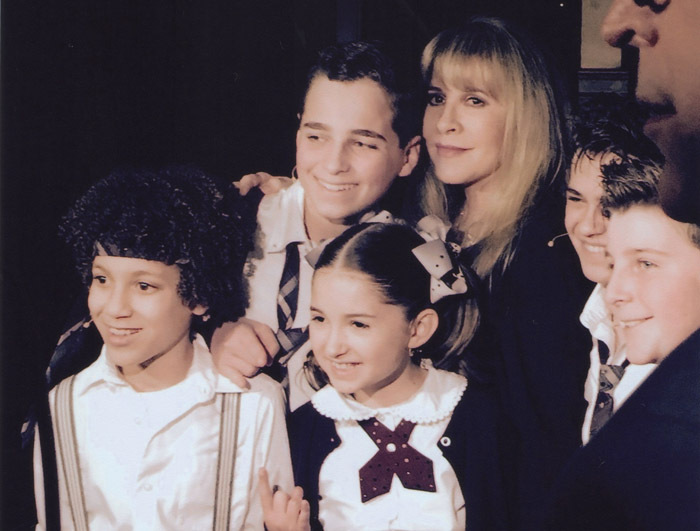 Stevie Nicks stunned the audience after the Tuesday night curtain call of School of Rock by performing a lively rendition of "Rhiannon" with the super-talented kid band from the Broadway musical. Wearing a signature black, flowy gown, Nicks twirled onstage as the crowd enthused at the surprise cameo. After she finished singing, she hugged the young players – Evie Dolan (on bass), Ethan Khusidman (on keys), Dante Melucci (on drums), Brandon Niederauer (on guitar) and Jersey Sullivan (on rhythm guitar) – and gave them an impressive endorsement. "To be in the presence of these kids that are so amazing that honestly sometimes I close my eyes and I'm not sure that it's not Fleetwood Mac," Nicks said. "It's very trippy. They are so good." Based on the popular Richard Linklater film starring Jack Black, the musical adaptation includes a new score by Andrew Lloyd Weber with lyrics by Glenn Slater and an expanded book by Julian Fellowes (ofDownton Abbey fame), School of Rock opened on Broadway in December and has a number of high-profile fans, including Nicks, whose songs are referenced in the show. When asked later, Nicks admitted that this was her first time on a Broadway stage. "I think this is my Broadway debut,and I'm thrilled. It was like being somewhere between eight and 13 again … I can't wait to send a tape of this to Lindsey and my other guitar player, Waddy, because they're gonna die. They're not gonna believe it. They're so good."